Career Decisions would like to extend our congratulations to the first cohort of graduates from our Diploma in High Performance Leadership programme, an internationally recognised qualification, Accredited at Level 8 by Dublin Institute of Technology. Shannon Chamber Skillnet selected Career Decisions Ireland to deliver this programme in the Mid-West in 2016. 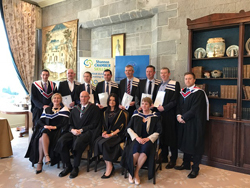 Career Decisions Ireland/Shannon Chamber Skillnet, Graduation Ceremony, Diploma in High Performance Leadership Conferring of Academic Awards for the CPD Diploma in High Performance Leadership took place on Friday 24th March at Dromoland Castle.